CHARLESTON, W.Va. – West Virginia students can get free help completing the Free Application for Federal Student Aid (FAFSA) and other financial aid forms during West Virginia’s sixth annual College Goal Sunday event. College Goal Sunday financial aid workshops will be held February 15 from 1 to 4 p.m. at 24 locations across the state. Anyone who is planning to pursue some form of education and training beyond high school within the next year should complete the FAFSA. That includes high school seniors, current college students and adults thinking about earning a degree or skill certificate. College Goal Sunday workshops are open to students of any age or income-level. The College Foundation of West Virginia (CFWV) coordinates the event. Students can pre-register, find locations and view a list of items to bring by visiting www.cfwv.com, the state’s free college- and career-planning web portal. Students and families should bring a driver’s license, both the student’s and parent’s Social Security number, 2014 tax records (or 2013 records if 2014 forms are not yet available), 2014 untaxed income records and information about investments and bank account balances. 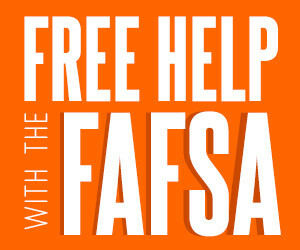 All information that is provided will be submitted through the federal government’s secure FAFSA network. Volunteers at College Goal Sunday sites are professionals who will keep students’ and families’ financial information and personal details private. CFWV is coordinated by the West Virginia Higher Education Policy Commission and supported by the West Virginia Council for Community and Technical College Education, the West Virginia Department of Education and the West Virginia Department of Education and the Arts. College Goal Sunday is made possible through the volunteer efforts and resources of public and non-profit organizations and businesses across the state, including the West Virginia Association of Student Financial Aid Administrators and college access organizations such as TRIO and GEAR UP. Additional funding is provided by a grant from USA Funds, a nonprofit corporation that helps students prepare for, access and achieve success in postsecondary education.